Replacing older servers in your datacenter with new, upgraded ones can go a long way to getting you the performance you need as your business grows. When selecting replacement hardware for your legacy systems, you can go with a basic configuration, upgrade some components as part of the new purchase, or upgrade all the ...components. Typically, these upgradeable components include the processor, operating system, drive type, and network card. In the Principled Technologies labs, we first measured typical performance of an example legacy server and legacy storage server, and then tested new server and storage server in multiple upgrade configurations to show the performance increases that come with upgrading these various components. We found in our tests that a new server and storage upgraded with the new Intel® Xeon® processor E5-2697 v2, Microsoft Windows Server 2012 operating system, Intel® SSD DC S3700 Series, and Intel® Ethernet Converged Network Adapter X520 series supported 3.5 times more VMs than the legacy server did. While upgrading all four components maximized performance, we also found that each individual component upgrade significantly increased the number of users, database orders, and VMs that the server could support. When you purchase a server, upgrading components from a basic configuration can help your infrastructure support your growing business for years to come. 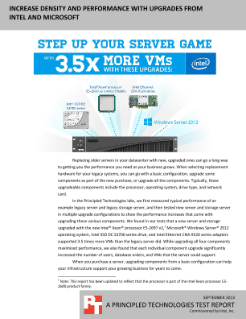 Read the full Intel, Microsoft Upgrades Increase Server Performance and Density White Paper.